I love Peanut Butter & Co. It is well documented. So when I heard they were coming out with chocolate hazelnut spreads...I nearly jumped up and down, I was so thrilled! And, lucky lucky me, they sent me a jar of their new Chocmeister Dark Chocolatey Hazelnut Spread to play with! Before I tell you about all the deliciousness you are presently gazing upon, let me give you the 411 on Chocmeister Chocolatey Hazelnut Spreads. First of all they come in 2 varieties, milk and dark chocolate. And they're made with 25% LESS sugar and 50% MORE protein than the leading chocolate hazelnut spread brand. Which is pretty amazeballs. And, as someone who immediately tried some: it tastes even better! The hazelnut flavor really comes through and it's perfectly delicious. Just the thing to eat on toast, with fruit, or ya know...in a perfect no-bake tart. It's summer. My favorite season. I love it. And it's hot-which I'm totally cool with but maybe we don't reeeeally want to use the oven if we don't have to, you know? 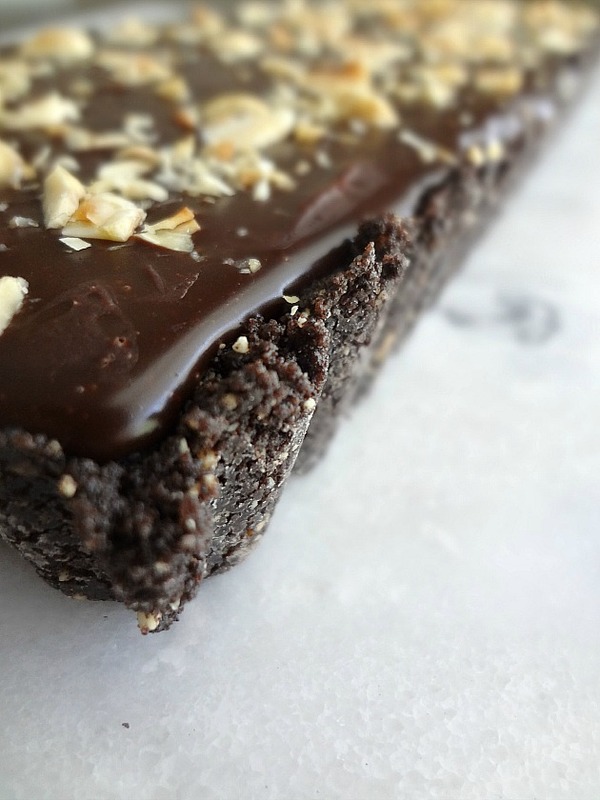 That's why I wanted to make you guys a super decadent no-bake dessert. And the Chocmeister Dark Chocolatey Hazelnut Spread was so rich and had such a great hazelnut flavor that I knew I wanted to play that up. And I DID. 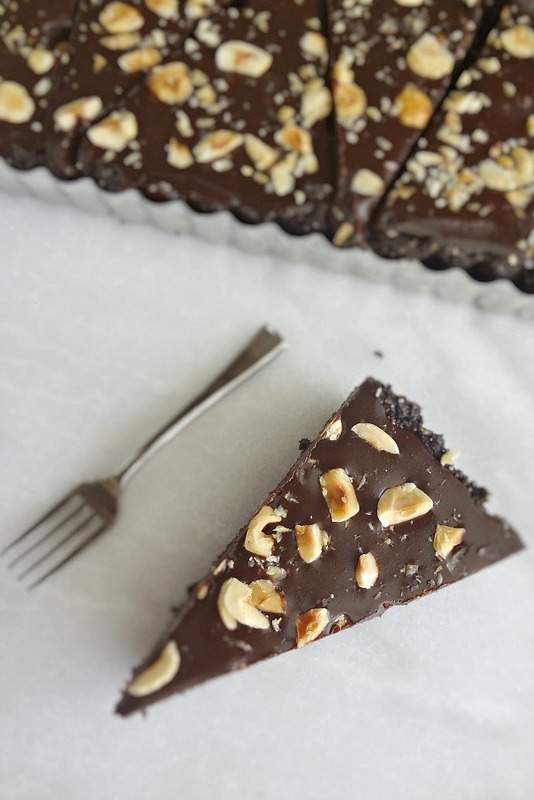 This tart seriously just embodies chocolate and hazelnut-in every way. 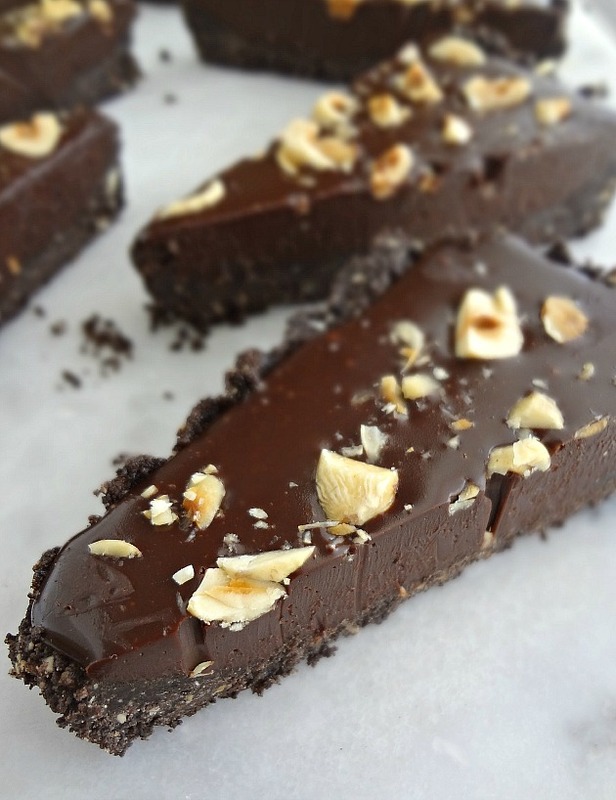 First, we have a chocolate cookie + hazelnut no bake crust: tastiness. Then I made a ganache with the Chocmeister and heavy cream. And topped it with chopped hazelnuts. You chill the entire thing and it...is...just...perfect. The texture of the filling is so silky and perfect and the crust and hazelnuts give you a bit of crunch. So good. SO SO GOOD. Makes one 5"x14" rectangular tart. In a food processor, blend together the chocolate cookies and hazelnuts until they're evenly sized crumbs. Add melted butter to the crumbs and pulse until moistened. Grease a rectangular 5"x14" tart pan (preferably with removable bottom) with nonstick cooking spray or butter. Press the moistened crumbs evenly into the bottom and up the sizes. Press very firmly so the crust is sturdy. Freeze while you prepare the filling. Measure the chocolate hazelnut spread into a medium-sized bowl. Heat a small saucepan of heavy cream over medium-high heat until it just starts to boil, bubbling around the edges but not a full, rolling, boil. Remove from heat and immediately pour over the chocolate hazelnut spread in the bowl. Whisk the cream and chocolate hazelnut spread until it's smooth and thickens-this may take a couple minutes. Let the ganache cool for about 5-10 minutes. 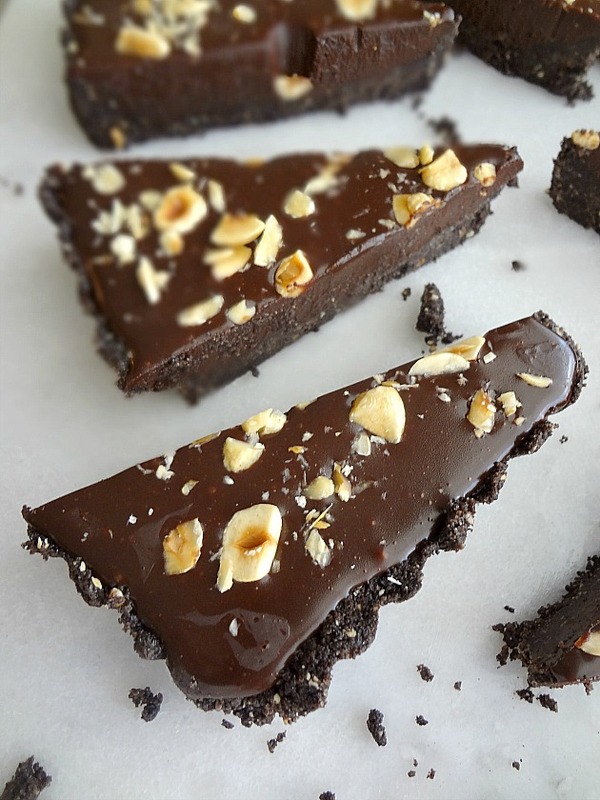 Remove the tart crust from the freezer and evenly pour the chocolate hazelnut ganache into it. 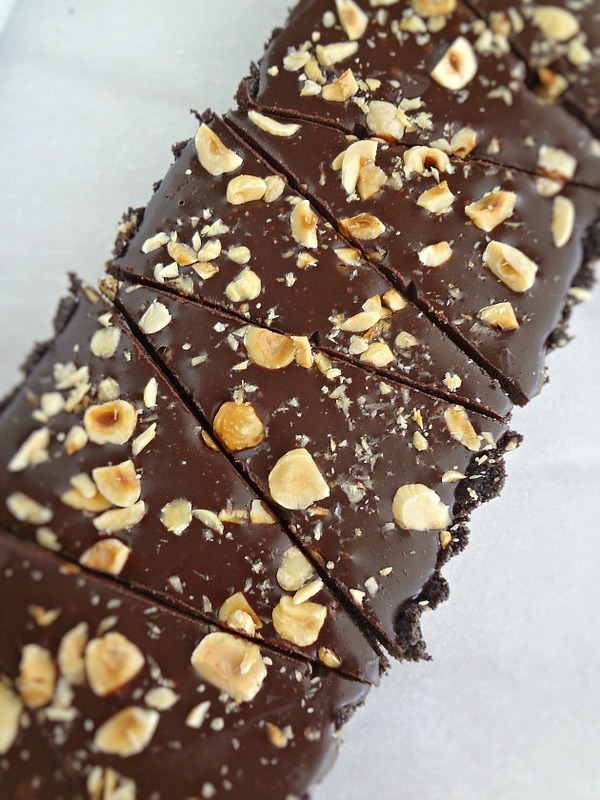 Top the ganache with chopped hazelnuts or fresh fruit, if desired. Place inside a covered container or very lightly cover with plastic wrap and refrigerate the tart for at least 8 hours, or overnight. Carefully remove the tart and cut into approximately 8 slices. Serve chilled! Store leftovers, covered, in the refrigerator for up to 1 week. Disclaimer: Peanut Butter & Co provided me with product to try, as well as sponsoring this giveaway, and I was under no obligation to review if I so chose. Nor was I under any obligation to write a positive review or host a product giveaway in return for the free product. My opinions, as always, are all my own.